Raised in Italy, Seea founder Amanda Chinchelli dreamed of becoming a fashion designer when she grew up. Eventually settling in California, she fell in love with surfing but grew frustrated with her inability to find swimwear that fulfilled her need for both style and performance. So she began stitching her own designs, putting them to the test in the SoCal waves. Other surfers took notice and requests for custom suits began rolling in, leading Chinchelli to officially launch Seea. Seea suits pay homage to the pioneering women who first dared to ride waves by using elegant, vintage design elements. The retro looks are fused with modern cuts, fun prints, and beautiful Italian fabrics. From surprisingly sensual one-piece suits to rashguards and surf leggings, Seea seeks to strike the perfect balance between function and style. At its core, Seea is “a celebration of the style, rhythm, and grace of women’s surfing.” As such, Seea suits have to do more than turn heads, they also need to perform in the surf. Seea’s signature surf suits bridge the gap between a rashguard and swimsuit, featuring UPF rated fabrics and long sleeves for extra protection. The upshot is, you don&apos;t have to forfeit the look you want to get the coverage and performance you need. Beyond beautiful suits and a passion for the waves, Seea is also committed to domestic production and sustainable design. Every Seea suit is 100% locally crafted in Southern California, right down to the vintage-style hangtags and the famous surf breaks that each suit is named after. 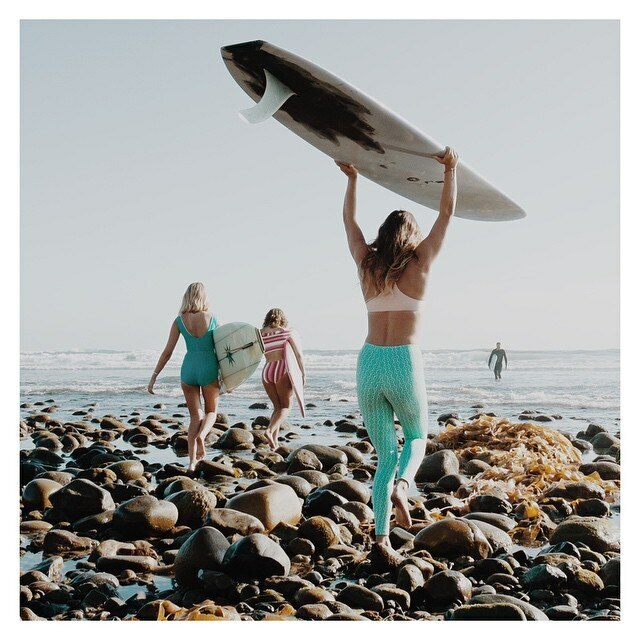 Making their homes near famous surf spots ranging from Hawaii to Mexico to SoCal, the Seea Babes are brand ambassadors who exemplify the rhythm, grace, and beauty of women’s surfing. While their backgrounds and interests are diverse, all the Seea Babes share a common morning ritual: wake up, choose a suit, get coffee, and go surfing—every day. Designed to look stunning both in and out of the water, the Hermosa Swim Shirt gives you sun protection and a bit more warmth. Play longer, catch more waves, and look great while you’re doing it—the rashguard has been reinvented. The Nosara blends a sensual bikini look with surf-worthy performance. The athletic, strappy back on the top and the side tie on the bottom are designed to keep the suit in place—even while duck-diving under the waves. As elegant as the waves it’s named after, the Hermosa Surf Suit is breathing new life into the one-piece. The sweetheart bust, belt-like waist, and keyhole back provide glamour and sensuality, while the long sleeves and UPF-rated fabric make it ideal for the surf. Get ready for your next beach vacation with the Capitola Reversible Bikini. A feminine-curved front up top and Seea’s cheekiest cut on the bottom are sure to turn heads, and the unique cross-back design won’t pull on your neck for all day comfort. Plus, the reversible design gives you two looks in one. Ever wish you could wear your favorite pair of yoga pants in the water? With the Calafia Legging you can do just that. UPF-rated fabric, fun prints, and a folded waistband allow you to go from the surf to shops to yoga without skipping a beat. Once you’ve surfed in it, you won’t surf without it. Made from a sleek Italian nylon/spandex blend for comfortable stretch, the slim-fitting Doheny features an extra-long length, raglan sleeves, and is UPF-rated for reliable sun protection.